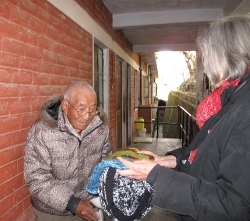 TCEF’s Elder sponsorship program connects interested sponsors here in the West with elderly Tibetan in exile that need help to survive. Although the educational sponsorship of children will continue to be our focus because of the transformative powers of education, the grandparents’ sponsorship is also very close to our hearts. While the children are our future hope – the grandparents are our connection to the past. Why Sponsor a Tibetan Elder? The generation of Tibetans now in their seventies and eighties have suffered great tragedies and survived many challenges. It is this generation that followed HH The Dalai Lama into exile and crossed the Himalayas into an unknown land. Many of them were nomads or farmers with no work or language skills for them to start a new life in exile. Almost all of them started their new lives in exile breaking stones by the roadside at minimum wage. It was a great change for them from the cool plateau of Tibet into the heat and humidity of India. Many of them did not survive – victims either to tuberculosis or their new found poverty. The Tibetan grandparents for whom we seek your help are the strong ones – the survivors. Many of them have depended on the ability for hard physical labor to survive. In old age they face an insurmountable challenge and that is why we seek your support. For $35 a month, you can provide much dignity and comfort. For the elders, your sponsorship will be like winning a small lottery – an unexpected annuity just when survival seemed most distant. Tibetan families are close knit and children and grandchildren do take care of their parents and grandparents. But, in cases where elderly Tibetan do not have family, they can be very vulnerable. Tibetans in exile do not have social security or a comparable old age pension scheme. That is why it is vital that we find support for them. The sponsorship funds help to purchase food, clothing, medicine and other essentials. It may help an elderly to go on a long wished for pilgrimage. TCEF received a special request from Gu Chu Sum, Dharamsala, to sponsor ex-political prisoners. Gu Chu Sum is an organization that is dedicated to helping Tibetan ex-political prisoners start new lives in exile. We’re honored to help knowing that these are people who have endured great pain and suffering for Tibet and its culture. Adopt an elder – Make this sponsorship your compassionate giving – your karma yoga. Support him/her till the end of their natural lives. Unlike the children’s sponsorship – Tibetan grandparents will not be able to write thank you letters. Instead, they will send all the prayers of a grateful heart your way. Make a sponsorship commitment for three years. TCEF will work hard to find another sponsor to pass on the baton of kindness at the end of your commitment. So your good work will continue even after you have stopped sponsoring. 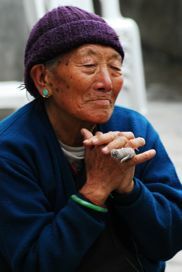 Make a one time donation to benefit Tibetan elders in need. Your donation will enable us to help an elder till we find a committed sponsor for them.